So when I heard that U2 were touring in support of the 30th Anniversary of their landmark album, I made sure to get a ticket. Admittedly I haven’t been a big fan of some of their efforts over the last two decades (Pop, anyone?) but I didn’t want to miss the opportunity to hear this record live again and to see if the songs held up three decades later. But first, the openers. The Denver based Lumineers have become popular over the past five years or so, due to their indie folk rock sing along hit “Ho, Hey.” They played that song along with about a dozen others to warm up the crowd, including “Ophelia” from their 2016 release Cleopatra. The band, lead by Wesley Schultz and Jeremiah Fraites, played to the half filled stadium as we waited for the headliners. And wait patiently, we did. About 90 minutes later, after a recorded track of The Waterboys' “The Whole of the Moon,” U2 hit the stage, launching into a few of their early hits I used to listen to on WLIR, one of the first radio stations in the US to support them. Those songs were “Sunday Bloody Sunday” and "New Year’s Day" (from War), “Bad” and “Pride (in the Name of Love),” their tribute to Dr. Martin Luther King (from 1984’s The Unforgettable Fire). During “Bad,” Bono had the audience light up their phones and it’s always spine tingling to see a stadium lit up (in ’87 we used cigarette lighters). All of these songs sounded amazing and laid the road for what was to follow. Then the opening chords of “Where the Streets…” started and yes, I did get the chills, as the crowd roared in appreciation. 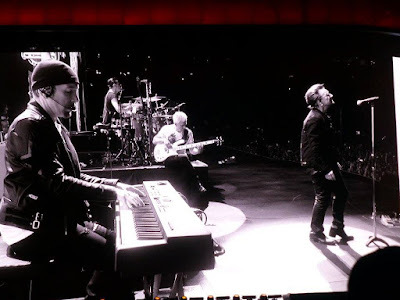 They continued to play the entire album in order accompanied by stunning HD images of the desert, mostly filmed by famed rock photographer and video director Anton Corbijn. Bono did not call out our current president by name, but U2 has always been a political (and humanitarian) band and mentioned that America is not just a place but an idea where immigrants are welcome to the land of opportunity. This point was hammered home during one of the encores, ”Miss Sarajevo,” where a young Syrian refugee was featured on the screens wanting a new life in the US, and then a huge image of her passport photo was literally handed above part of the crowd. So, to answer my original question: does The Joshua Tree hold up after all these years? Yes! The songs don’t sound dated at all, and many of the themes of the record (love, loss, desperation, desire, wanting a better life) are timeless. I’m paraphrasing here but Bono himself said that songs are mysterious things and when you think you know them well, they can surprise. By mixing stunning visual imagery with these timeless songs and tight musicianship, U2 still delivers an unforgettable live experience.